Having a team of players that are physically fit is crucial if you want your team to succeed. Turn the basketball over more often. Take dumb shots on offense. 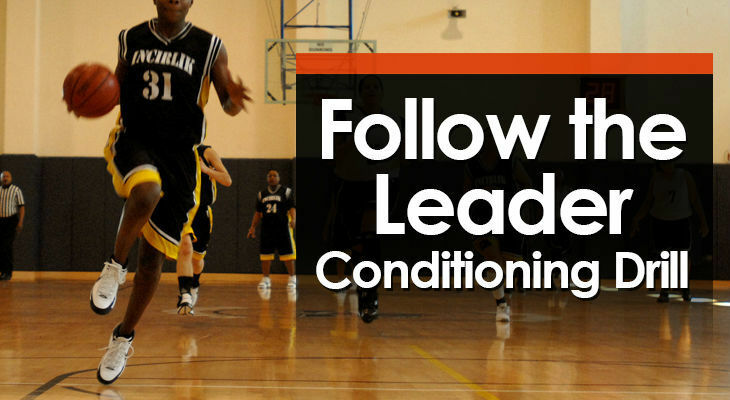 Spend valuable practice time getting your team to work on their conditioning without a basketball. This could be long-distance running or pointless sprints. 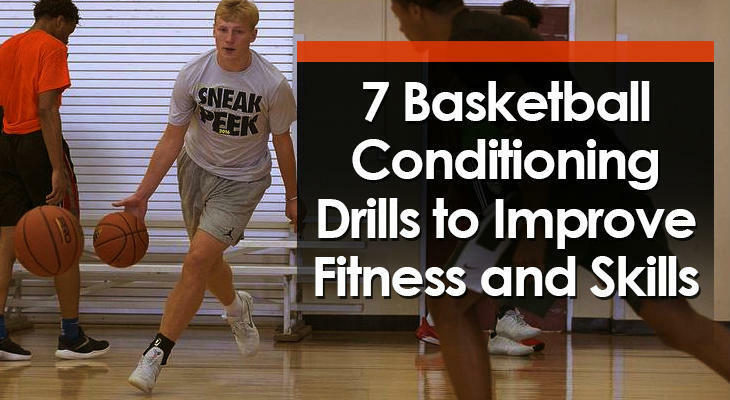 Instead, the basketball drills you use at practice should incorporate conditioning so that your players are improving their fitness and working on their skills at the same time. 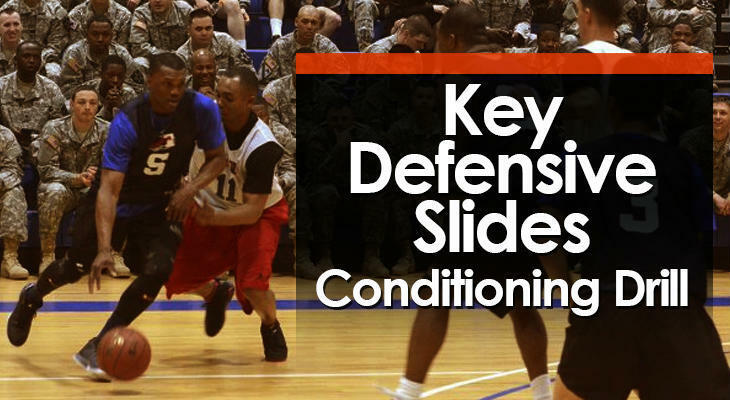 Below are 7 basketball conditioning drills that simultaneously improve skill and fitness. The drill begins by planning 2 on 2. 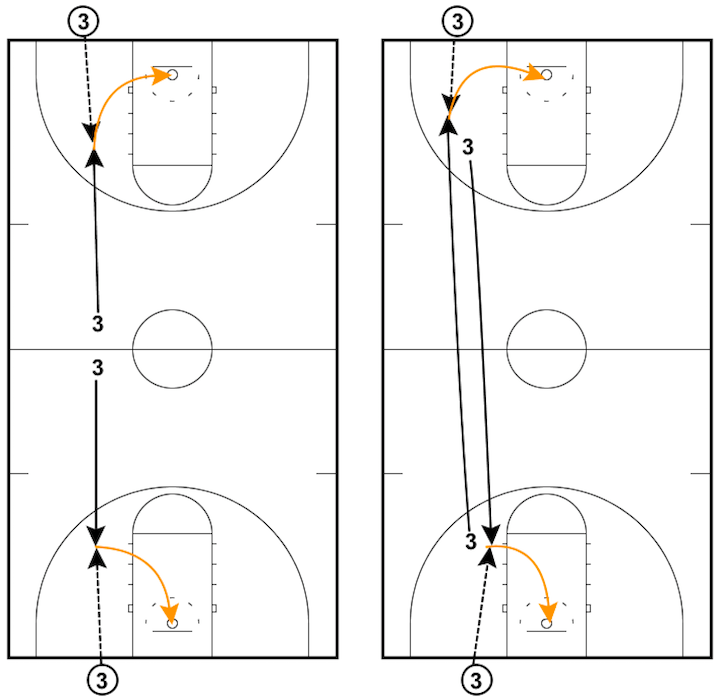 On either a score or a stop, the offensive team must transition quickly to defense while the defense outlet passes to two new offensive players on the closest free-throw line extended. They then attack two on two and this routine repeats. 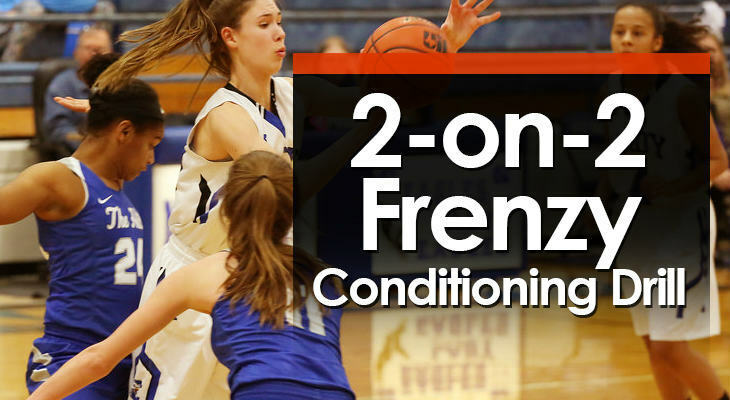 A great transition drill to work on player conditioning as well as offensive and defensive transition. The offense and defense will be faced with a new situation each time. 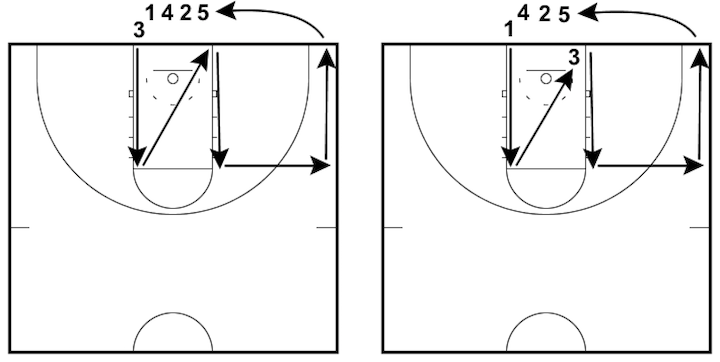 This drill is performed best with 8 or more players, but you must have at least 6. 2 players begin on defense, 2 players begin on offense, and then you must have at least 1 player on each free-throw line extended. The drill begins with the 2 offensive players attempting to score against the two defenders in the half court. On either a stop or a score, the defenders outlet the basketball to one of the two players on the closest free-throw line extended while the two offensive players quickly transition to defense. On the catch, the two new offensive players sprint down the court and attempt to score quickly in transition. They then become the new defenders as the sequence continues. There is no scoring system and the stops when the coach decides. Fewer Players - If you only have 6 or 7 players (less and the drill won’t work), instead of 4 groups starting on each extended free throw line, have 2 groups start at the mid-court line. Remind your players that it’s a transition drill, we don’t want players slowing the basketball down too much. 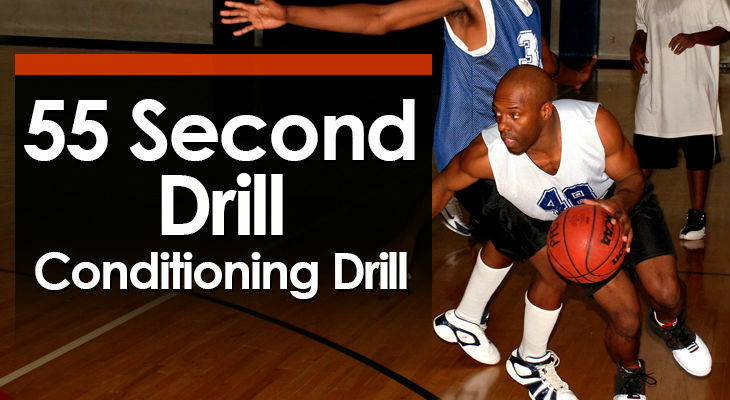 Depending on the number of players you have, this drill is great for conditioning. Use it for short spurts during training. 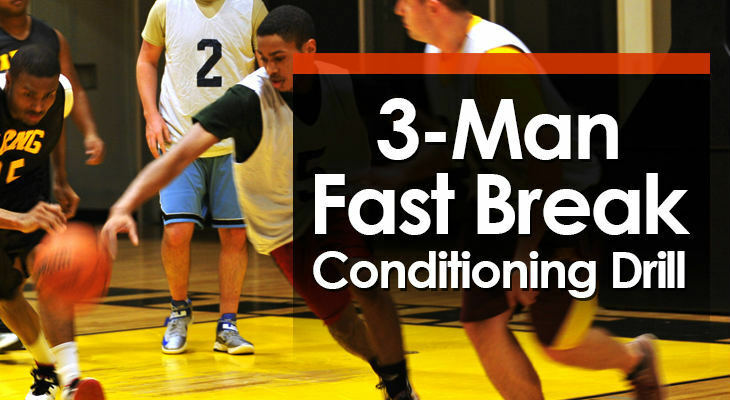 Groups of 3 players continuously run the fast break while switching roles and positions. 3 passes must be made on each trip down the floor without dribbling. Each group needs to complete 3 trips so every player finishes a layup before the next group comes in. 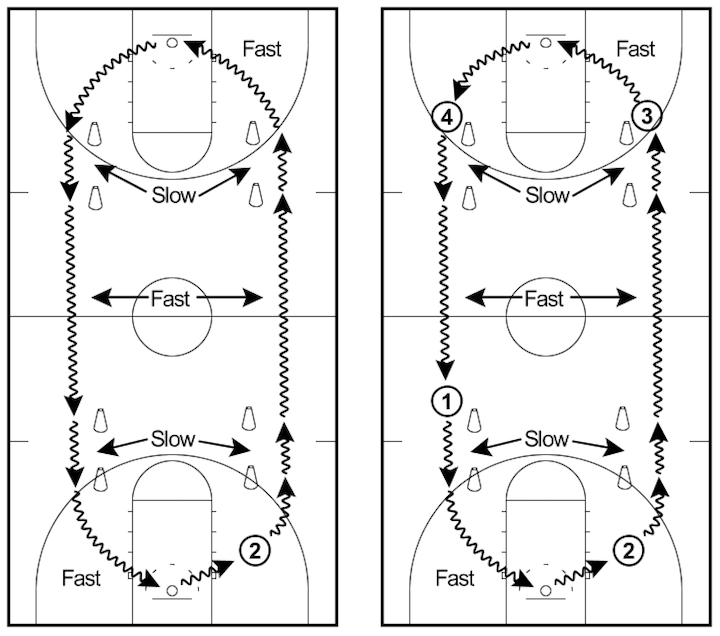 This is a basketball conditioning drill that allows players to practice passing while running the fast break. Players will need to judge their teammate’s speed and then accurately pass the basketball out in front of them. Also a fantastic drill for conditioning! ​3 lines of players spaced out along the baseline. ​Player in the middle like has a basketball. The middle player with a basketball starts the fast break by passing to either teammate. For these instructions we’ll say they pass to the player on the right. The receiver on the right will catch the basketball and must immediately pass back to the player sprinting the middle of the court. By this time, the third player (on the left) should have sprinted up court and will be near the opposite three-point line. The middle player passes in front of them so they can catch and finish with a layup without dribbling. The player who gets the assist must follow the pass and sprint and touch the corner before transitioning the other way. The player that finished the layup runs through and will be the outlet pass. And the third player who was the original first pass will grab the rebound. On the rebound, the outlet pass is made to the player who just made a layup, the rebounder gets the basketball back, and then passes to the third player who should have sprinted the court for the layup. The third trip down the floor continues in the same manner. By the end, everyone should have played all positions and made a layup. Immediately upon the first groups completion of the drill, there must be three more players waiting on the baseline ready to start. 6 made layups - One group must sprint 6 trips of the floor so each player makes two layups. I only recommend this for older groups. It’s tough! Allow 1-2 dribbles - If you’re coaching young players without the strength to make long passes, allow them 1-2 dribbles before each pass. Players must be focused, accurate with their passes, and sprint the floor. The basketball should never hit the floor during this drill. It’s very important that players pass out in front of their teammate so that they can run onto the pass. Timing is everything. Absolutely no travels. It’s better for players to dribble the basketball if they need to than travel. The drill must always finish with a made layup. If teams miss, they must make another trip of the floor until they make the layup. Players get in groups of 4 players. There will be two shooters and two rebounders/passers. Shooters start at the half-court and run in to receive a pass and shot. Both shooters then switch sides and sprint to the other end of the floor to receive a pass and shot from the other rebounder/ passer. The shooters continue swapping ends for a certain amount of time and then they swap over. 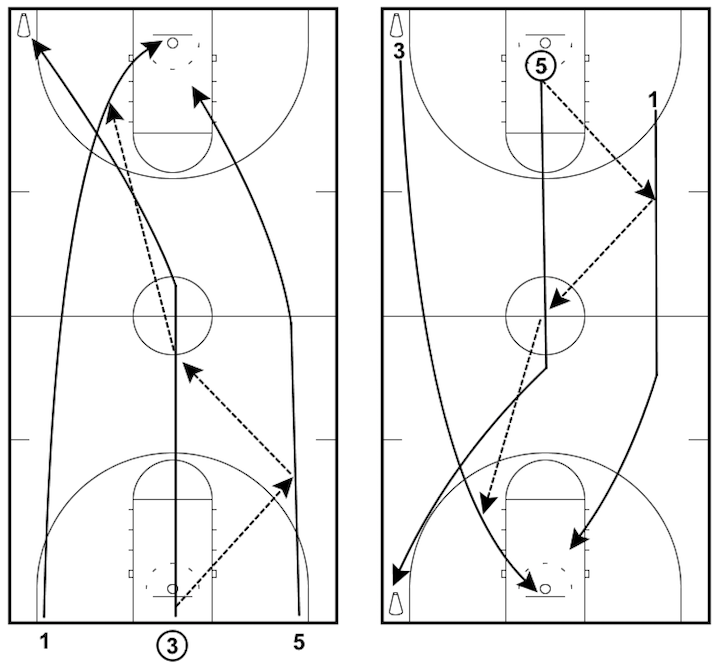 A great drill to practice shooting while fatigued and after sprinting up and down the court. Players all get in groups of 4. Groups choose 2 shooters and 2 rebounders/passers to begin the drill. All passers have a basketball. No more than 3 groups of 4 on a court at once. Stopwatch to keep track of the time. 1 minutes 1-dribble pull-up shots. On the coach’s call, shooters at the half-way line run down to one of their partners and receive the ball for the catch and shoot. After shooting they immediately turn and run down to the other end of the court, passing by their shooting teammate, and receive the basketball off the other passer for the shot. This process continues for one minute before the coach calls out "change!" Players quickly swap over so that shooters become passers/rebounders and passers/rebounders become shooters. Pairs continue to change until both pairs have shot 3 times each and the total for the drill is 6 minutes. Shooting Spots - In the example outline above we have players do 1 minute of mid-range shots, 1 minute of three-point shots, and 1 minutes of 1-dribble pull-up shots. Feel free to vary these in any way you want. Make sure players are SPRINTING each time up and down the court. We want them fatigued when shooting! Watch the footwork and make sure no one is travelling. Players sometimes find it hard to go from a sprint to a catch-and-shoot. Players should have target hands up and be in stance when receiving the basketball. Passes must be on-time and on-target. No lazy passing. Players complete four lengths of the court agains the clock (not necessarily 55 seconds) while performing a variety of dribbling challenges. This is a great drill for developing dribbling skills while also incorporating conditioning. 4 - 5 players along the baseline. They should be an even distance apart. Each player needs two basketballs. They start the drill using only one but will need the second one on the last up-and-back. The coach must have a stopwatch or a way to time the drill. The first up-and-back consists of players dribbling to the end of the court with their right hand, and then back with their left hand. 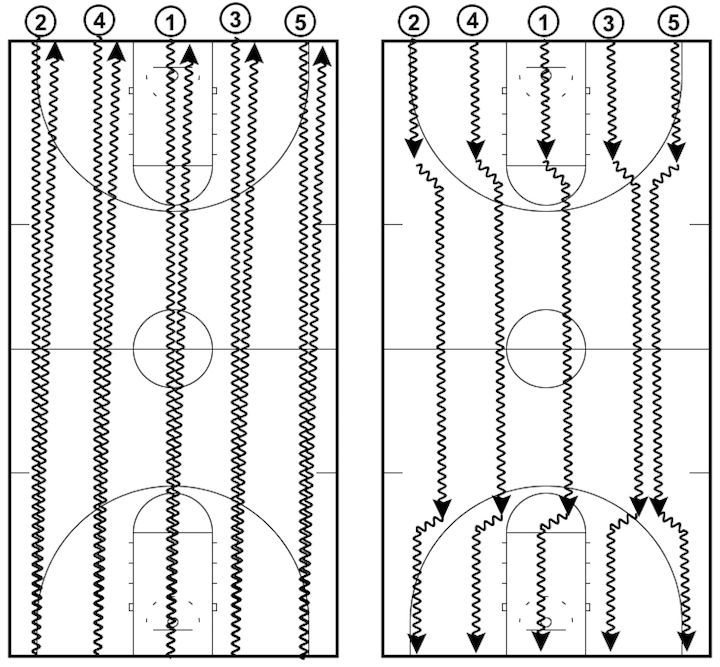 For the second up-and-back each player must perform two dribble moves each direction. These can be through the legs, behind the back, crossovers, in-and-out dribble, spin move, etc. Must be 4 different moves. The third up-and-back consists of the pretzel walk going forwards, and then on the way back players must perform the pretzel walk going backwards. For the final up-and-back the second ball comes into play. The player must dribble up and back bouncing two basketballs at once. This drill is scored by time. Players must finish the drill as fast as possible. A good time for a high school player is 55 seconds. For younger players, perform the drill once and see what they get and then try to beat it every time you run the drill. Add More Lengths of the Floor - This is a very customisable drill. Feel free to add anything you want to the drill but make sure to increase the time allowed. Change the Dribbling Moves - For example you might not want your players to do the pretzel walk and instead choose for them to dribble up and down the floor backwards. Players must be keeping their heads up throughout the entire drill. Players must push as hard as they can throughout the entire drill. Don’t let any of them slack off! Players form a single line and pass the basketball off the backboard to each other. Each player must go up strong for the rebound using good rebounding fundamentals and land with the basketball. They then pass the basketball off the backboard to the next player and quickly clear out to the end of the line. A great basketball conditioning drill and rebounding drill for teaching the basic fundamentals of rebounding to young players. This allows players to focus 100% on their rebounding technique without worrying about the next action. Players form a straight line starts approximately 2 - 3 feet in front of the free-throw line. The first player in the line has a basketball. The drill starts with the first player in line passing the basketball off the backboard and quickly clearing out to join the end of the line. The player behind them must jump up high, rebound the basketball using correct rebounding fundamentals, and then land on the ground with a strong base. After establishing balance, this player then throws the basketball off the backboard for the next player in line before quickly clearing out and joining the end of the line. This process continues for a set amount of time or set number of repetitions. No landing – To increase the difficulty of the drill and putt he focus on timing, explosiveness, and conditioning, consider creating a rule that the players can’t land with the basketball. For more information on this check out the drill “Off the Glass”. Two lines – If there are a large number of players in your group, form two lines instead of one. This takes advantage of both sides of the backboard. Players should attempt to catch the basketball at the highest point. Immediately ‘chin’ the basketball on the catch. This means placing the basketball under the chin with elbows out for protection. Players must land with feet shoulder width apart with knees slightly bent for a strong base. Always rebound with two hands! Player perform defensive movements in a specific pattern using the key as a guideline. This is a continuous drill to prevent players from standing around. This is a great drill for working on different defensive movements and can be used as a warm-up drill. Players will work on many defensive fundamentals: defensive slides, back-pedalling, close-outs, drop-steps, and sprinting. A line of players begins behind the baseline on one side of the key. If available, place d-men or cones on the elbows so that players have a visual to close-out to. No basketballs are needed for this drill. The first player in line starts the drill be sprinting out and closing out on the elbow. They then drop step and slide to the spot where the opposite side of the key and baseline meet. Once the first players starts this slide, the next player in line starts the close-out. The first player then sprints out to the other elbow and closes-out again. They will then defensive slide across until they reach the sideline. For the final movement, players will back-pedal to the baseline and then join the end of the line to repeat again. The drill continues for a set amount of time. Increase the distance – You can increase the distance of the drill by moving the cones further out. Place them at the three-point line instead of the elbows of the free-throw line. Opposite side of the floor — Ensure that half-way through the time you set aside for the drill you get players to switch sides of the floor and perform everything opposite. 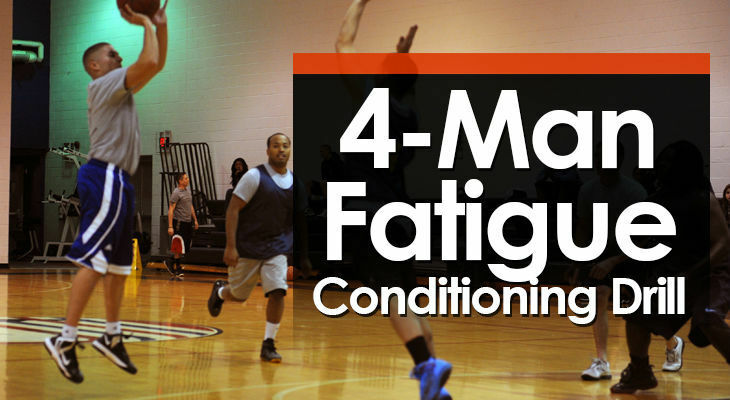 Players should complete the course as quick as they can while still in control of their body. Pay attention to the footwork of the players. Players must be closing out with short steps and get one hand up. They must stay on-balance during this. Players complete full-court layups in a large circle changing speeds when they pass different cones. This can be used for hesitation practice or simply changing the speed of a dribble. 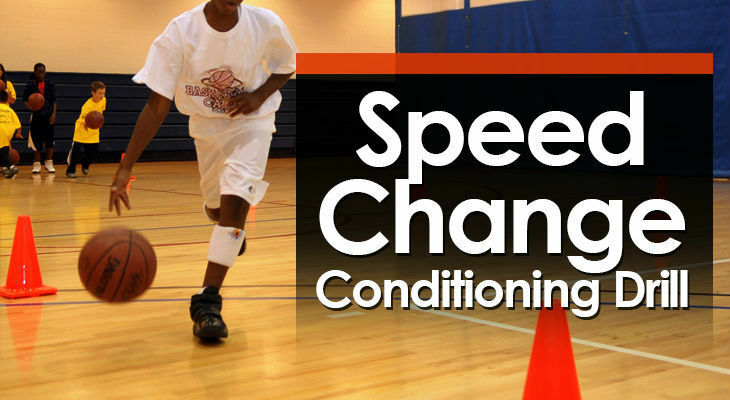 This drill allows players to practice quickly changing speeds during a game. Being able to change speeds is one of the most over-looked areas of being a great dribbler. Set up 4 cones on either side of the court. Two cones should be paired up close to the free-throw line at both ends of the court as shown on the diagram. Every player has a basketball and start behind the baseline. The first player in line start by dribbling down one side of the court with their outside hand. When they reach the first cone, they must slow down their dribble. When they reach the second cone, the player must quickly change speed and explode out dribbling down the court. The same process happens at the opposite end of the court before speed dribbling in to finish the layup. The player completes the same process as they dribble back down the opposite side of the court. The next player in line begins as soon as the player in front has passed the first set of cones. Eventually all players should be dribbling on the court in a large circle. 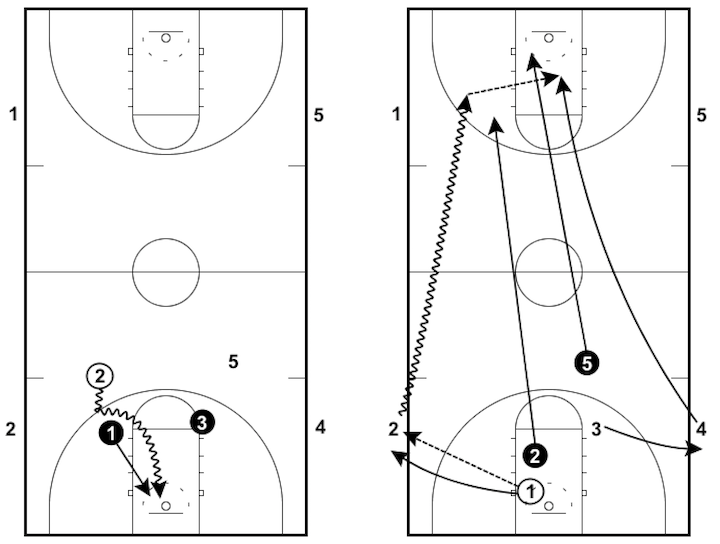 Hesitation Move - In the original players simply change speeds during the drill. For variation, have players perform a hesitation move before exploding out with their dribble. This refers to quick, sharp steps before pushing the basketball out in front. Change Direction - Make sure that you change directions of the drill half way through so that players are practicing the same moves on their opposite hand. If you have them available to you, use different colors for the cones. Yellow cones can indicate slowing down, and green cones can indicate speeding up the dribble. This gives players a visual reference. There must be a noticeable change of pace when players are performing this drill. Players should lift their head up quickly and look to where their teammates would be or the rim when slowing down. This is a great way to get the defense out of their stance. Players must push the basketball out in front on the change of pace or the hesitation move.